I’m due to start work on a section of an anthology horror film about London entitled ‘Bloody London’, and it made me trawl back through the history of British anthology horror films. The first and best was ‘Dead of Night’, and is the only example wherein the wraparound story is the scariest of them all. although the episode with Michael Redgrave and his ventriloquist’s dummy is disturbing, especially in the scene where it comes to life. But although they enjoyed a vogue in the early seventies the majority are really not very good; ‘Tales From The Crypyt’ and ‘Vault of Horror’, based on the old EC Comics twist-ending tales, are about the best, although the latter was weakened by squeamishness. The Amicus film ‘From Beyond The Grave’ proved an outstanding example of the genre, even though the stories, from veteran chiller writer Ron Chetwynd Hayes, were pretty simplistic. The second tale, in which Ian Bannen becomes involved with unctuous old soldier Donald Pleasance and his real-life daughter Angela, is imbued with a creepy, mildewed seventies melancholia that’s hard to shake off. An echo of Pinter can be felt in the Pleasance performances, and the low budget worked in the film’s favour, depopulating London’s narrow streets to the point of appearing post-apocalypse. Portmanteau films of every kind had a happy history in England, from trios of tales by Terrence Rattigan to the fondly remembered but risible ‘Dr. Terror’s House Of Horrors’. The latter featured our man at Brentford Nylons, Alan ‘Fluff’ Freeman, terrorised by plastic weeds in a performance that, in all honesty, has not entirely stood the test of time. ‘Asylum’ featured tales about patients in a mental hospital, while ‘Torture Garden’ showcased the patchy post-‘Psycho’ stories of Robert Bloch. The portmanteaux were easy to shoot in segments, and although quality control of scripts clearly remained a problem, performances from reliable stalwarts including Herbert Lom, Joan Collins, Glynis Johns, Ian Ogilvy, Ian Carmichael, Margaret Leighton, Terry-Thomas, Peter Cushing and Roy Castle were never less than full-blooded. I think most of them were glad of a couple of days’ work for an envelope of used fivers. Of the Hollywood portmanteaux, ‘Tales from the Darkside’ and ‘The Twilight Zone’ work best, but only half of each film really works. The real problem with the anthology movies is that audiences feel vaguely cheated by watching what appear to be glued-together TV episodes. The best solution is to work them into each other to weave a continuous and seamless film. It will be interesting to see how this attempt turns out. My favourite is the Monster Club 1981, the scenes in the club were great! Loved the stripper! You know Herbert Lom just died, I suppose. Enjoyed the EC films, but then as I’ve posted before, I was an EC-comics collector as they came out with a fine stash until… but that’s a tale twice before. I’ll have to look for Dear of Night because you’re completely right, the wraparound story is always the weakest. A bit of grout packed in to just hold the separate tales in place. You will, please, let us know when the new film’s about to be let loose on the world. I’ll my son, he’s always up for “improving literature” (Carr reference via G. Fell) and film. Dear of Night? I think not. Can’t see you writing that. Gurr… I was doing better. I’m reading The Historian just now and am fascinated by the way the vampire theme is allowed to grow slowly and gradually stronger and more visible as you work through. I wonder how it would film with all the different locations, times, and characters. Helen – when you’ve finished I’d be intersted to read what you thought. 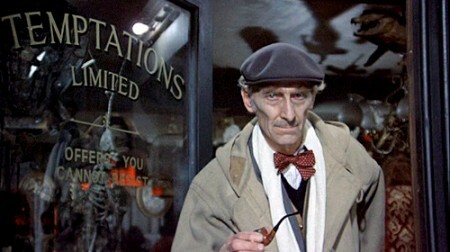 I do love the anthology horrors of Amicus but Dead of Night was hard to better for sure. Most of them were very hit and miss of course but of my favourites: Nigel Patrick’s fate in ‘Blind Alleys’ from Tales From the Crypt and David Warner feeding the mirror in ‘The Gate Crasher’ from Beyond the Grave are still very scary. And I’ve always had a soft spot for Asylum (Amicus were always best with equal parts camp fun with genuine horror) – the undisputed highlight being Sylvia Syms in ‘Frozen Fear’ (but always remembered by me as ‘Rest in Pieces’) coming back (piece by piece) to seek vengeance on her cheating husband and his mistress is absolutely hysterical and still creepy. I used to think these films frightened me (in my youth) until I read your books…now they really scare me! I absolutely love reading them, but sometimes I shut the book and keep the light on! The recent Trick R Treat is a very good US anthology horror film (if you haven’t seen it).